Something happened the other day at the dog park that reminded me of how much our animals reflect our energy. Becky and I were walking down the path with Hanna, Doc and King. All three were running freely ahead and off in every direction. They love that about the dog park…no leashes just total freedom. If you aren’t familiar with my dog family, Hanna is a Westie, about four years old. Doc is going on 7, a Maltipoo who weighs about 10 lbs. King is 8 and though large in bravery is a mere five and a half pounds of Toy Poodle (he named himself). 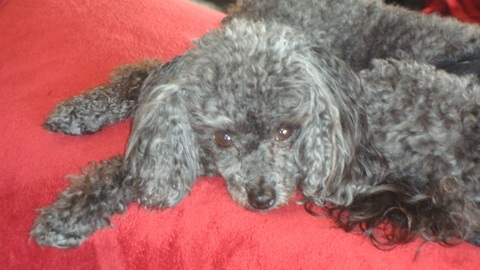 There is also Maddie a 9 yr old Toy Poodle but she wasn’t at the dog park that day. As we were walking down the path, I heard some people back a few hundred yards (or that’s my best guess…I have no clue about distance). What got my attention was that the woman was clearly distressed and calling to her dogs, I could tell she was worried a fight might break out. I looked back and noticed two large dogs. From the energy in her voice, I was now concerned that these dogs might present a problem for mine. I didn’t say anything but I was listening closely and checking back occasionally to see where they were. As we continued walking I noticed that King was no longer running out in front with the other two but had glued himself to me to the point that I needed to be careful not to step on him. That’s when I realized he had picked up on my concern and was sticking close by his pack leader probably thinking he might need to take over that position. I noticed the woman behind us had leashed her dogs and so took a deep breath and let out the tension. King ran ahead and joined the others. Our animals feel our energy and are influenced by it all the time. Over hundreds (thousands) of years they have learned to stay tuned into their environment and all the energy and emotions that emanate from it. This has helped them to survive as a species. When they live with us on a daily basis, they are exposed to our energy and often react to it. When we are anxious, angry, stressed, excited or sad the energy of those emotions is felt by our companions. Fortunately, many of them are very good at deflecting the energy. If they are able to get outside and be a dog or cat, they have the opportunity to burn off that excess energy. For some, it can become too much without a release valve and unwanted behaviors surface. Often I have communicated with animals in these situations and by helping them understand the situation and modifying their environment to better support them, the behavior changes. The interesting part is that if the overall situation doesn’t change, the behavior may reappear after a period of time. And then I hear back six to twelve months later that help is needed again. Mind you, I am not placing blame here or judging. I’m just sharing what I have observed and what the animals have shared with me. Fortunately, they love us unconditionally and are willing to help us in anyway they can. They know we are trying to live a more peaceful life and they don’t expect perfection. Maybe if we didn’t expect perfection from ourselves we would experience less of the anxiety, sadness, etc. From an energy sensing standpoint, we humans have moved away from our awareness of what is happening around us. We are exposed every day to an inordinate amount of stimulus that has actually deadened our consciousness to the energy that is us and surrounds us. As babies we come into our lives very aware of our energy body and all of the energy around us. But we are quickly led into a world that emphasizes thinking over feeling and speaking over reading with energy. Our intuitive senses are put on the back burner. Then enter all sorts of technology to distract us from our lives and the majority of us walk through life without really paying attention to what is right in front of us. Even though we aren’t conscious of the energy around us, on some level our being is aware. We are absorbing other’s energy…we just aren’t usually aware of it. This constant barrage creates a great deal of stress everyday…stress that we are not even aware of. When this hidden stress triggers physical responses in our body (the flight-fight response of increased adrenaline, and cortisol) we can suffer with a host of physical ailments. There is a social trend to becoming more awake human “beings” and less human “doings”. By studying our animal companions we can learn a great deal about being present, being aware of our energy bodies, and playing just for the sheer joy of it. In the process we become more grounded and provide a better environment for our animal companions. What a timely message from Doc. Since I have been retired I spend most of my day doing something with the dogs, walking, playing, training, etc. I was having a great time and thought the dogs were too. Then one day when I finally sat down for a few minutes and was immediately srrounded by my dogs who wanted only to snuggle, I realized that we don’t have to be “doing” something all the time to be having fun. I now always find the time to sit in peace and quiet and just snuggle with my buddies. I also saw a great sweatshirt that said, “How to handle stress like a dog: If you cant’ eat it or play with it…then pee on it and walk away.” I ordered it right away. Thanks for sharing that Kelli. I love that sweatshirt! Where can I get one? Thank you Wendy! How would you suggest teaching my dogs not to bark at our wonderful neighbours who also have 2 horses and a donkey and two small children? We would like to swap house sitting with them but my dogs two rescues are aggresive towards them They are wonderful. My dogs are both 100 pounders, Simba is a shepard huskey and blind, and our youngen Cody is wolfhound, border collie, shepherd. tri-polar! Any suggestions? We tried taking Cody out for a walk with the woman and Cody wasn’t nice. We’ve tried playing with the ball over the fence and Cody is not nice to the ball when get catches it. We’re trying treats over the fence now, and Cody sat for the treat. Continuing with that. blessings for what you do! It’s hard to say exactly what is going on but generally speaking, if the dogs don’t accept their humans as pack leaders they feel the need to be the pack leaders and if they tend toward a more fiesty nature, that can mean aggression. Working with a good positive trainer who can come in and see how you interact with them can be helpful. Communication can be part of the strategy but with aggression you need more tools. I LOVE what you do & I would like to add that for some of us (most likely the minority!) we are TOO sensitive to the energies around us–& so the reaction is to shut down or run away. Thank goodness for animals! Joey, my St. Bernard, has “saved” me in so many ways! He keeps me centered and grounded—and clued in to the present moment. Sensitives are in a minority but not as minor as you might think ;-). I agree that shutdown can be a coping strategy. I used it in the past myself. Over the years I have learned many techniques for being a highly sensitive person in a not so sensitive world. I’m sharing what I have learned in some new programs that include online teleseminars, live events and mentoring. If you are interested in knowing when the programs come up, be sure to sign up for my newsletter list on my website if you haven ‘t already. Announcements will be coming soon! And I’m so glad you have Joey! • Access your inner power in 10 blissful minutes. • Release the energy of overwhelm. 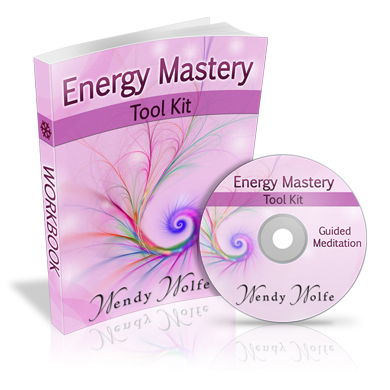 • Create calm, healthy energy boundaries. • Feel empowered, safe and protected. To receive Wendy’s Blog and updates fill in your name and email in the form above. Is this Monster Hiding Within? Copyright © 2015 Wendy Wolfe. All rights reserved.